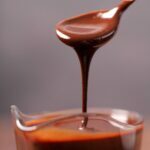 Smooth and velvety vegan chocolate sauce. 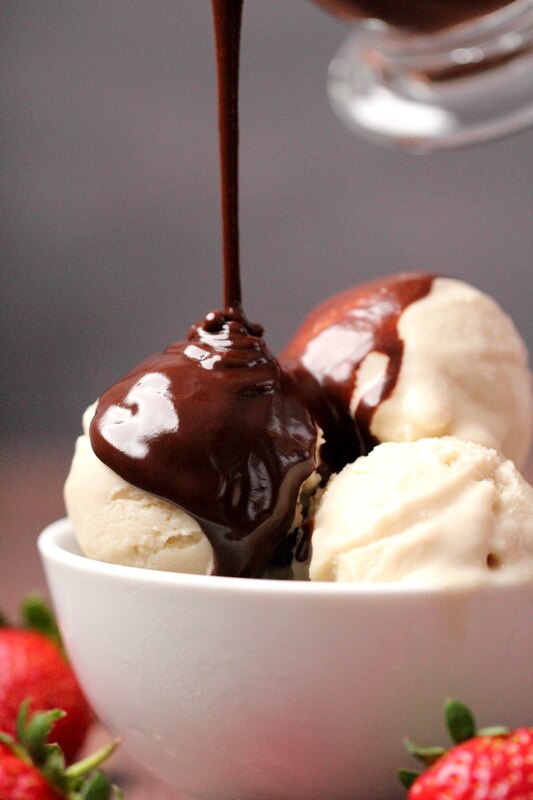 This ultra rich dark chocolate sauce is divine drizzled over ice cream or cakes or just eaten off the spoon. 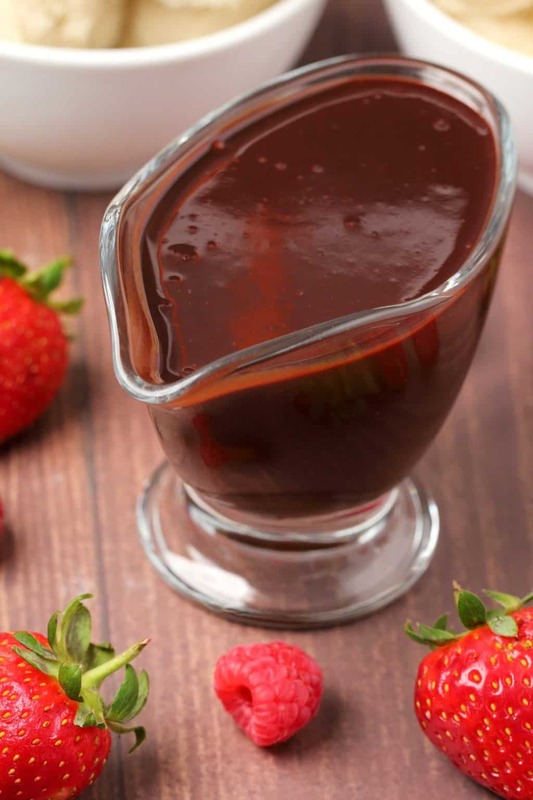 This vegan chocolate sauce ticks all the boxes. 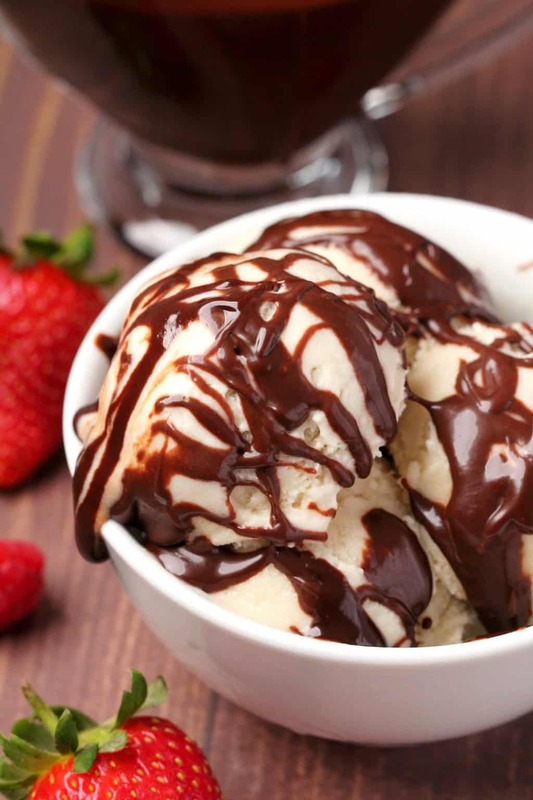 It’s smooth, velvety and absolutely divine drizzled over ice cream. 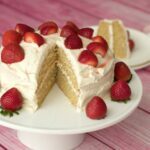 It’s also wonderful to dip strawberries into or pour over a fruit salad to fancy it up a whole lot or drizzle it over a cake or just eat it off the spoon. It’s super easy to make and way better than the store-bought variety. Add coconut cream, maple syrup, sugar and cocoa powder to a saucepan and whisk it vigorously until it reaches a gentle simmer. Remove it from the heat and add in some tahini (trust me! 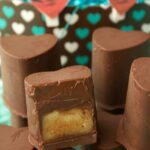 ), vanilla and some vegan chocolate or chocolate chips. Whisk it until smooth. Now you have a sauce that is ready to use! You can use it as a hot sauce or let it cool to room temperature and use it then, whatever is going to work best for how you want to use it. Does it taste like coconut? No it doesn’t! The taste is chocolate all the way. But if you are allergic to coconut and need to use something else, you could use a non-dairy milk instead. It will result in a slightly thinner consistency, which would still be okay with this sauce. Alternatively, use a non-dairy cream. What can I use instead of maple syrup? You can use any syrup you like. 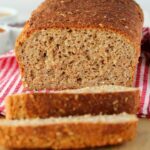 Can I use coconut sugar instead of regular sugar? Sure! This would work great. Tahini? What’s that for? 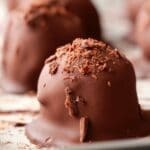 Haha, I used tahini when I made our homemade vegan chocolate. 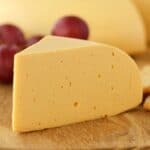 It just adds creaminess and texture while being quite neutral in flavor once combined with other things. You can switch this out for a nut butter too, cashew nut butter in particular would work great too. But try it with tahini first (unless you’re allergic). What kind of vegan chocolate should I melt into it? 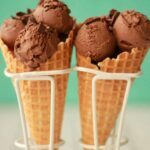 You can use either vegan chocolate chips or any good tasting vegan chocolate of your choice. 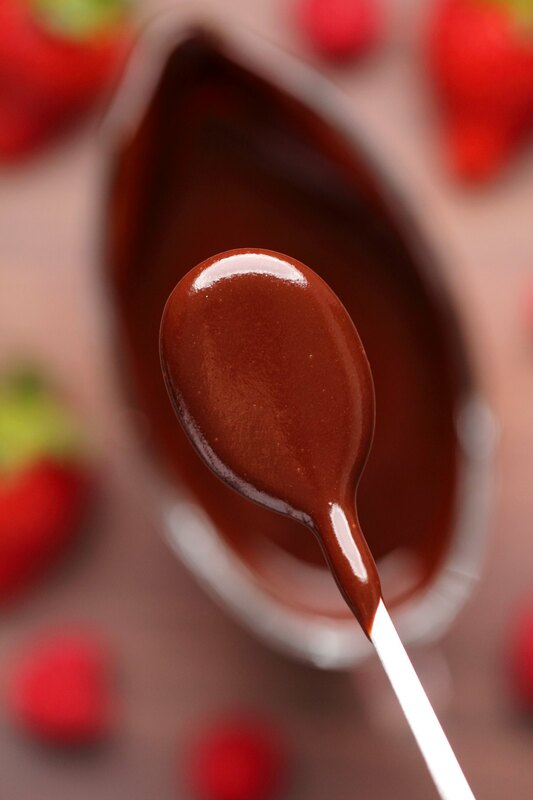 I have melted a chocolate bar into this sauce and used chocolate chips, either way was delicious. 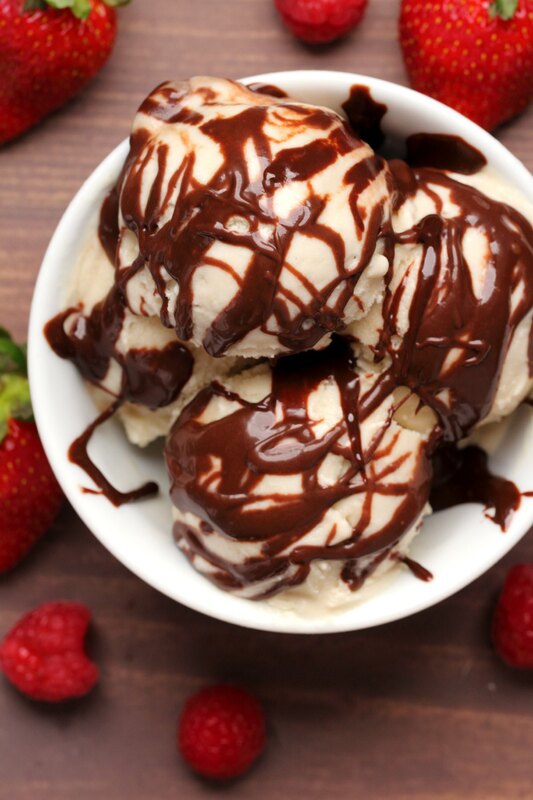 What does this vegan chocolate sauce taste like? 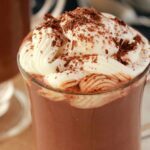 It tastes like liquid chocolate! 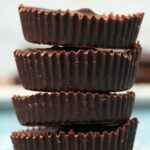 It definitely leans more towards dark chocolate in terms of flavor, so if you prefer you can decrease the amount of cocoa powder if you are less inclined towards that super rich dark chocolate flavor. How long does it keep in the fridge? It will keep a few days in the fridge. It goes solid in the fridge though, keep that in mind. It’s not an issue though, you can just put it in the microwave for 30 seconds to a minute and whisk it up again. It doesn’t need to be hot to get to the right consistency, it just needs to be room temperature and you can whisk it up and use it. Can I freeze it? Sure, just place it into the fridge to thaw overnight and then heat up in the microwave until it reaches a liquid consistency, whisk it up and use. Divine drizzled over so many things! Keep leftovers stored in the fridge and enjoy within a few days. It goes solid in the fridge, so bring it back to a liquid consistency (the microwave is fine!) before use. 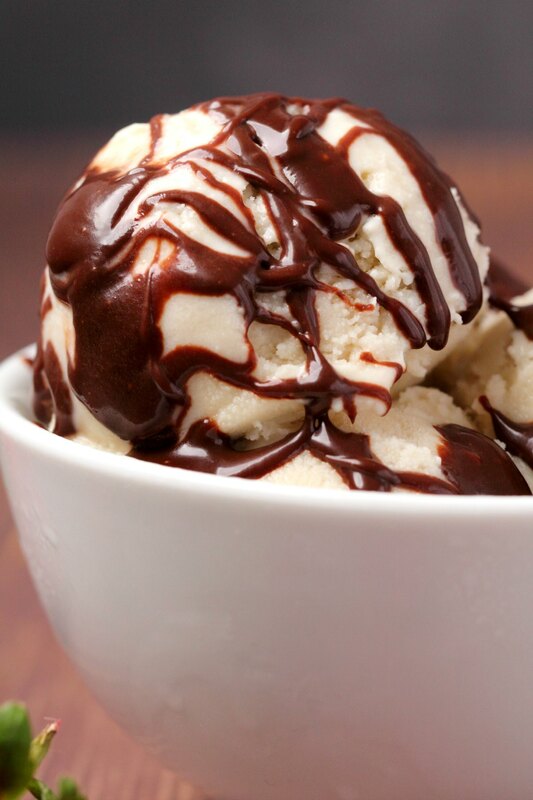 Drizzle it over some vegan ice cream. 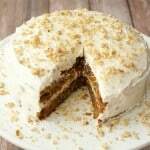 Serve it with a vegan chocolate cake. 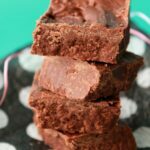 Enjoy it with some delicious vegan brownies. Dip your strawberries or your vegan chocolate muffin into it. Eat it with your vegan waffles or vegan pancakes at breakfast. Spoon it over your vegan overnight oats or eat it with some vegan banana bread. Add the coconut cream, maple syrup, sugar and cocoa powder to a saucepan and whisk it constantly while it heats until it reaches a simmer. 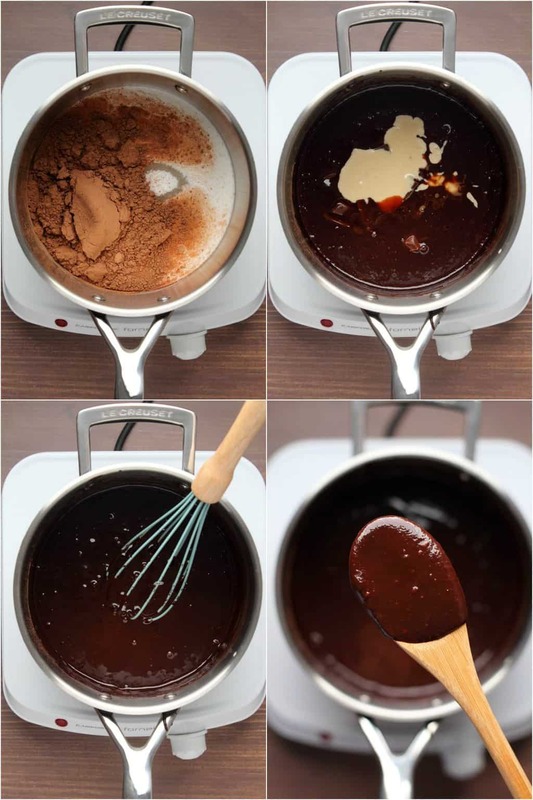 It will take a little while for the cocoa powder to whisk in properly, but just keep whisking and it will combine. As soon as it reaches a simmer, remove from the heat and add in the tahini, vanilla and vegan chocolate or chocolate chips and whisk until smooth. 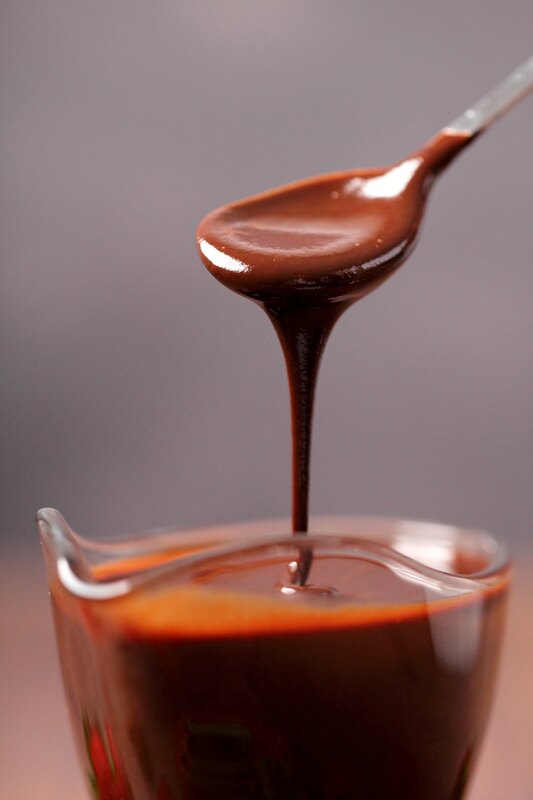 Either use it immediately if you want a hot chocolate sauce or let it cool to room temperature and use it then. Keep leftovers stored in the fridge. It will firm up to solid, so when you want to use it, heat briefly in the microwave (around 30 seconds to a minute) and then whisk it smooth. Use as an ice-cream topping or to dip fresh fruit, or serve it with vegan brownies or cake. *You can use any syrup it doesn’t have to be maple syrup. I don’t want to be pushy but if you want a baking challenge you could try making a vegan opera cake! 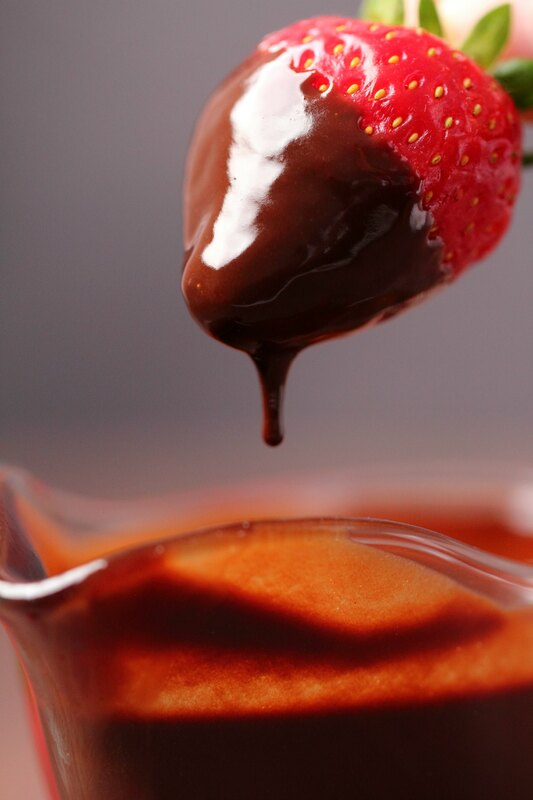 This sauce looks so luscious and decadent!